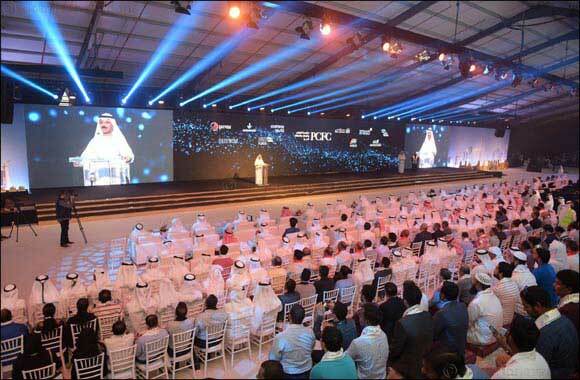 Dubai – November 28, 2018: Ports, Customs, and Free Zone Corporation, with its subsidiaries: DP World, Dubai Customs, Tarakhees, Dubai Trade and JAFZA celebrated today (Wednesday 28th November 2018) the 47th UAE National Day at Port Rashid under the theme “Zayed..story of a nation” in the presence of Sultan bin Sulayem, DP World Group Chairman & CEO and Chairman of Ports, Customs and Free Zone Corporation, and the heads of PCFC entities and more than 1,500 employees. Sultan bin Sulayem congratulated President His Highness Sheikh Khalifa bin Zayed Al Nahyan, His Highness Sheikh Mohammed bin Rashid Al Maktoum, Vice President and Prime Minister and Ruler of Dubai, His Highness Sheikh Mohammed bin Zayed Al Nahyan, Crown Prince of Abu Dhabi and Deputy Supreme Commander of the UAE Armed Forces, Their Highnesses the Supreme Council Members and Rulers of the Emirates, and the people of the UAE on the glorious occasion of the Union’s 47th anniversary. 'Today we celebrate the UAE National Day to show our deep feelings of love and loyalty to the nation. This love manifests itself in the many great achievements that have been made in such a very short history of only 47 years. Those achievements are the fruits of farsighted vision, hard work and dedication, and we look ahead to a more brilliant future, full of success and accomplishment at the hands of devoted Emirati men and women. We promise to follow the same route of achievements and challenges created by the Founding Fathers. “The wise leaders’ vision has enabled and encouraged the UAE people to pursue their dreams without any hesitation to help the UAE become one of the best countries in the world. “The Late Sheikh Zayed bin Sultan Al Nahyan and Sheikh Rashid bin Saeed Al Maktoum and their brethren, the founders of the UAE worked with all determination and diligence to develop the country and turn it into a preferred destination for tourism, trade, investment and work”. “There are projects in the UAE that crossed the borders and turned into international success. Emirates Airlines and DP World are two leading companies that managed to spread out and strike a great example of world-class service delivery, distinctive transparency and great governance. The UAE allowed for free trade and offered businesses many facilities. Now 10% of the world’s trade passes through DP World terminals around the world. “That coherence and transparency between the leadership and the people has catapulted the UAE into higher ranks and places. The leaders’ “you can” attitude has enabled people to work ahead without stress and innovated in different fields. As His Highness Sheikh Mohammed bin Zayed Al Nahyan, Crown Prince of Abu Dhabi and Deputy Supreme Commander of the UAE Armed Forces said; we will celebrate exporting the last barrel of oil because by that time we will have developed a number of alternatives and diversified our economy for sustainable prosperity and happy life”. The festive event commenced with the National Anthem and included a number of functions such as the heritage village, folklore dances, military parade performed by a group of customs inspectors, poetry recited by the poet Thiab bin Ghanim, and a visual display entitled “Story of a nation” that recounted the UAE achievements and successes on land and in space. Bin Sulayem awarded the sponsors and partners of this event including Dubai Police, Dubai Municipality, Dubai Civil Defense Department, and Dubai Corporation for Ambulance Services, plus private companies including GTR Motors, Sfondo, and Eros.